Eric Steig, a professor at the University of Washington, told Mashablethat satellite data’s main flaw is that it doesn’t tell us much about the changing climate where we live — that is, at the surface. Steig says that surface temperatures are reliable, yet GISS has massively altered them over the past decade. In fact, GISS has nearly doubled reported 1880 to 2000 warming since their 2003 version. They have altered the data so much, they had to stretch the scale at both ends to fit their alterations on to the graph. This is not “reliable” data. It defies explanation how any scientist could report this as reliable data. But it is much worse than it seems. The tampering above sits on top of a huge amount of earlier tampering. But it gets even worse. Why would you choose surface temperatures over satellite temperatures to measure global warming? The whole point of global warming is that it warms the troposphere, not the asphalt five feet from the thermometer. Science doesn’t get any worse than this, Eric Steig. Making such a bold claim based on completely unsupportable data. You have completely reversed reality and misled the public and policy makers. Their data fraud is like the old “boiling frog” parable. A little change here, a little change there. Nothing so large that the alarm bells go off for the average person — but over a period of time you get adjustments equal to all the purported warming! Satellite readings may have a few minor problems but when you compare them to our land and sea based temperature records, they are 27 million times better. 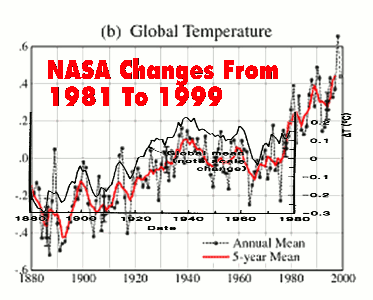 Satellite records are very comparable to rural, un-adjusted temperature records. They are not very comparable to urban, adjusted temperature records. I remember some years back, when James Hansen still seemed somewhat on the level, that he wrote an article discussing the proper method for collecting surface temperatures. He went to great lengths discussing the difficulties in doing this systematically and consistently. I seem to recall he thought the sensors should be located approximately six feet (2M) above the ground. Obviously, his methodology has changed quite a bit from that point where they didn’t even feel the need to use actual measurements for many sites but instead used Filnet to extrapolate the appropriate data they wanted for a given site. I guess that is what progressives call progress. I’d really love to have the source link to the 2003 graph. The link given is broken. Is there some way I could find it on my own? Any clues you could give me for a head start? I’ll share what I find.